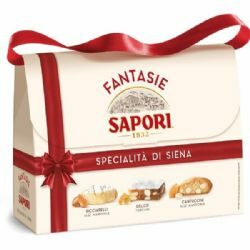 Sapori "Fantasie di Siena" Pastries from Siena - a large box with a selection of traditional Italian biscuits and cakes including ricciarelli, cantuccini and pieces of panforte. 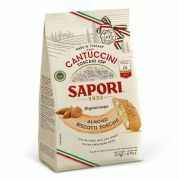 Ingredients: Cantuccini: Wheat Flour, Sugar, Almonds 20%, Egg Yolk 4.8%, Eggs 4.8%, whole pasteurised Fresh Milk 4.8%, Butter, Honey 0.5%, Raising Agents (disodium diphosphate, sodium hydrogen carbonate), Salt, Flavourings. 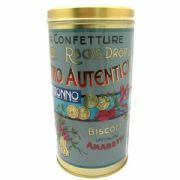 May contain soya and other nuts. 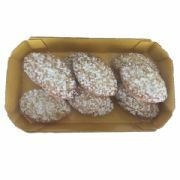 Ricciarelli: Sugar 43% , Almonds 41% , Water, food Fibre, Icing Sugar 6% (Sugar, Corn Starch), Egg White, Flavorings, Raising Agent (ammonium carbonate), Salt, preservative: Sorbic Acid. 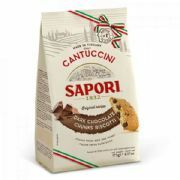 May contain wheat, soya, milk and other nuts. 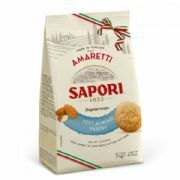 Panforte: Orange Peel, Candied Citron and Melon 36% (Orange Peel, Citron, Melon, Glucose-Fructose Syrup, Sugar, Citric Acid, preservative (anhydride sulphur)), Sugar, Wheat Flour, Almonds 15%, Glucose-Fructose Syrup, Icing Sugar 2.9% (Sugar, Corn Starch), Potato Starch (Potato Starch, Water), Spice mixture 0.3%. 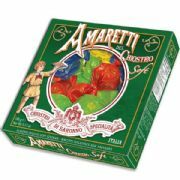 May contain other nuts.